Viral infection involves the incorporation of viral DNA into a host cell, replication of that material, and the release of the new viruses. 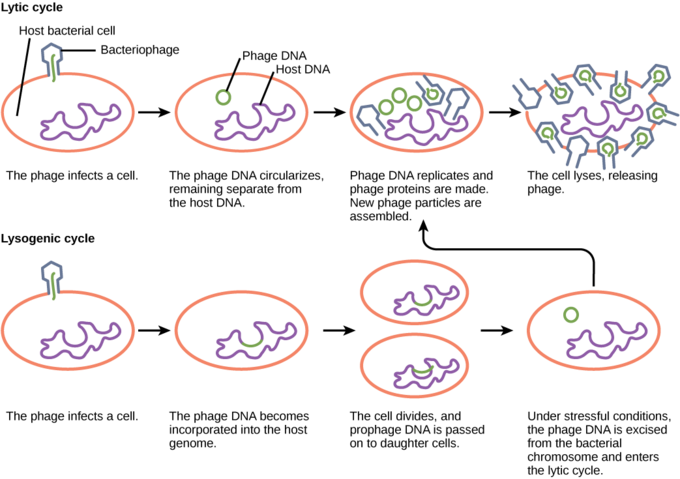 Viral replication involves six steps: attachment, penetration, uncoating, replication, assembly, and release. During attachment and penetration, the virus attaches itself to a host cell and injects its genetic material into it. During uncoating, replication, and assembly, the viral DNA or RNA incorporates itself into the host cell’s genetic material and induces it to replicate the viral genome. During release, the newly-created viruses are released from the host cell, either by causing the cell to break apart, waiting for the cell to die, or by budding off through the cell membrane. A virus must use cell processes to replicate. The viral replication cycle can produce dramatic biochemical and structural changes in the host cell, which may cause cell damage. These changes, called cytopathic (causing cell damage) effects, can change cell functions or even destroy the cell. Some infected cells, such as those infected by the common cold virus known as rhinovirus, die through lysis (bursting) or apoptosis (programmed cell death or “cell suicide”), releasing all progeny virions at once. The symptoms of viral diseases result from the immune response to the virus, which attempts to control and eliminate the virus from the body and from cell damage caused by the virus. Many animal viruses, such as HIV (Human Immunodeficiency Virus), leave the infected cells of the immune system by a process known as budding, where virions leave the cell individually. During the budding process, the cell does not undergo lysis and is not immediately killed. However, the damage to the cells that the virus infects may make it impossible for the cells to function normally, even though the cells remain alive for a period of time. Most productive viral infections follow similar steps in the virus replication cycle: attachment, penetration, uncoating, replication, assembly, and release. Pathway to viral infection: In influenza virus infection, glycoproteins attach to a host epithelial cell. As a result, the virus is engulfed. RNA and proteins are made and assembled into new virions. A virus attaches to a specific receptor site on the host cell membrane through attachment proteins in the capsid or via glycoproteins embedded in the viral envelope. The specificity of this interaction determines the host (and the cells within the host) that can be infected by a particular virus. This can be illustrated by thinking of several keys and several locks where each key will fit only one specific lock. The nucleic acid of bacteriophages enters the host cell naked, leaving the capsid outside the cell. Plant and animal viruses can enter through endocytosis, in which the cell membrane surrounds and engulfs the entire virus. Some enveloped viruses enter the cell when the viral envelope fuses directly with the cell membrane. Once inside the cell, the viral capsid is degraded and the viral nucleic acid is released, which then becomes available for replication and transcription. The replication mechanism depends on the viral genome. DNA viruses usually use host cell proteins and enzymes to make additional DNA that is transcribed to messenger RNA (mRNA), which is then used to direct protein synthesis. RNA viruses usually use the RNA core as a template for synthesis of viral genomic RNA and mRNA. The viral mRNA directs the host cell to synthesize viral enzymes and capsid proteins, and to assemble new virions. Of course, there are exceptions to this pattern. If a host cell does not provide the enzymes necessary for viral replication, viral genes supply the information to direct synthesis of the missing proteins. Retroviruses, such as HIV, have an RNA genome that must be reverse transcribed into DNA, which then is incorporated into the host cell genome. To convert RNA into DNA, retroviruses must contain genes that encode the virus-specific enzyme reverse transcriptase, which transcribes an RNA template to DNA. Reverse transcription never occurs in uninfected host cells; the needed enzyme, reverse transcriptase, is only derived from the expression of viral genes within the infected host cells. The fact that HIV produces some of its own enzymes not found in the host has allowed researchers to develop drugs that inhibit these enzymes. These drugs, including the reverse transcriptase inhibitor AZT, inhibit HIV replication by reducing the activity of the enzyme without affecting the host’s metabolism. This approach has led to the development of a variety of drugs used to treat HIV and has been effective at reducing the number of infectious virions (copies of viral RNA) in the blood to non-detectable levels in many HIV-infected individuals. The last stage of viral replication is the release of the new virions produced in the host organism. They are then able to infect adjacent cells and repeat the replication cycle. As you have learned, some viruses are released when the host cell dies, while other viruses can leave infected cells by budding through the membrane without directly killing the cell. Bacteriophages, viruses that infect bacteria, may undergo a lytic or lysogenic cycle. Viruses are species specific, but almost every species on Earth can be affected by some form of virus. The lytic cycle involves the reproduction of viruses using a host cell to manufacture more viruses; the viruses then burst out of the cell. The lysogenic cycle involves the incorporation of the viral genome into the host cell genome, infecting it from within. latency: The ability of a pathogenic virus to lie dormant within a cell. bacteriophage: A virus that specifically infects bacteria. 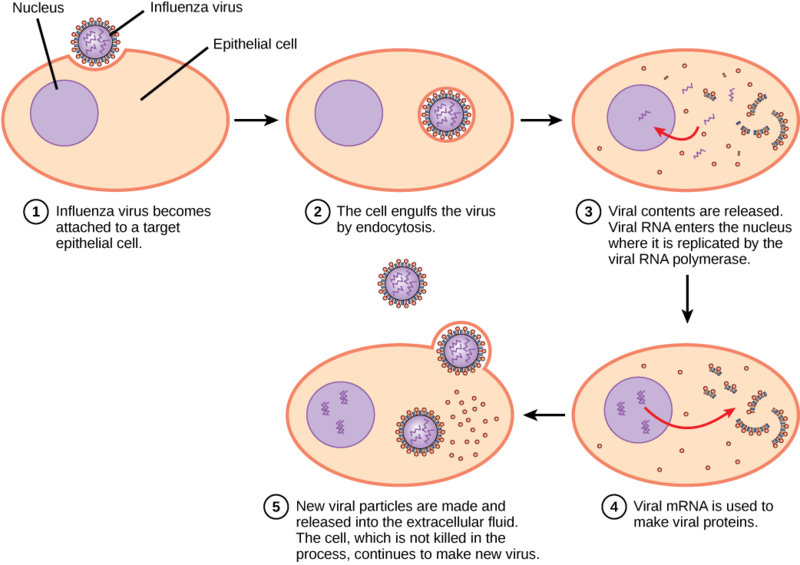 lytic cycle: The normal process of viral reproduction involving penetration of the cell membrane, nucleic acid synthesis, and lysis of the host cell. lysogenic cycle: A form of viral reproduction involving the fusion of the nucleic acid of a bacteriophage with that of a host, followed by proliferation of the resulting prophage. Viruses are often very specific as to which hosts and which cells within the host they will infect. This feature of a virus makes it specific to one or a few species of life on earth. So many different types of viruses exist that nearly every living organism has its own set of viruses that try to infect its cells. Even the smallest and simplest of cells, prokaryotic bacteria, may be attacked by specific types of viruses. 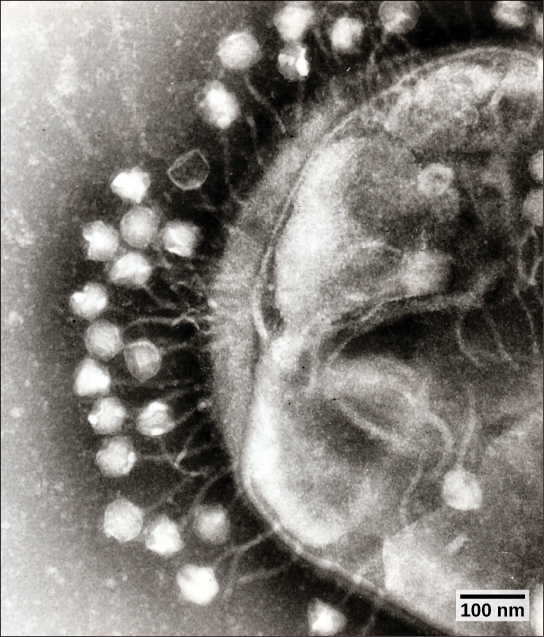 Bacteriophage: This transmission electron micrograph shows bacteriophages attached to a bacterial cell. Bacteriophages are viruses that infect bacteria. Bacteriophages may have a lytic cycle or a lysogenic cycle, and a few viruses are capable of carrying out both. When infection of a cell by a bacteriophage results in the production of new virions, the infection is said to be productive. Lytic versus lysogenic cycle: A temperate bacteriophage has both lytic and lysogenic cycles. In the lytic cycle, the phage replicates and lyses the host cell. In the lysogenic cycle, phage DNA is incorporated into the host genome, where it is passed on to subsequent generations. Environmental stressors such as starvation or exposure to toxic chemicals may cause the prophage to excise and enter the lytic cycle. With lytic phages, bacterial cells are broken open (lysed) and destroyed after immediate replication of the virion. As soon as the cell is destroyed, the phage progeny can find new hosts to infect. An example of a lytic bacteriophage is T4, which infects E. coli found in the human intestinal tract. Lytic phages are more suitable for phage therapy. Some lytic phages undergo a phenomenon known as lysis inhibition, where completed phage progeny will not immediately lyse out of the cell if extracellular phage concentrations are high. In contrast, the lysogenic cycle does not result in immediate lysing of the host cell. Those phages able to undergo lysogeny are known as temperate phages. Their viral genome will integrate with host DNA and replicate along with it fairly harmlessly, or may even become established as a plasmid. The virus remains dormant until host conditions deteriorate, perhaps due to depletion of nutrients; then, the endogenous phages (known as prophages) become active. At this point they initiate the reproductive cycle, resulting in lysis of the host cell. As the lysogenic cycle allows the host cell to continue to survive and reproduce, the virus is reproduced in all of the cell’s offspring. An example of a bacteriophage known to follow the lysogenic cycle and the lytic cycle is the phage lambda of E. coli. Viruses that infect plant or animal cells may also undergo infections where they are not producing virions for long periods. An example is the animal herpes viruses, including herpes simplex viruses, which cause oral and genital herpes in humans. In a process called latency, these viruses can exist in nervous tissue for long periods of time without producing new virions, only to leave latency periodically and cause lesions in the skin where the virus replicates. Even though there are similarities between lysogeny and latency, the term lysogenic cycle is usually reserved to describe bacteriophages. Animal viruses have their genetic material copied by a host cell after which they are released into the environment to cause disease. Animal viruses may enter a host cell by either receptor -mediated endocytosis or by changing shape and entering the cell through the cell membrane. Viruses cause diseases in humans and other animals; they often have to run their course before symptoms disappear. Examples of viral animal diseases include hepatitis C, chicken pox, and shingles. Animal viruses, unlike the viruses of plants and bacteria, do not have to penetrate a cell wall to gain access to the host cell. Non-enveloped or “naked” animal viruses may enter cells in two different ways. When a protein in the viral capsid binds to its receptor on the host cell, the virus may be taken inside the cell via a vesicle during the normal cell process of receptor-mediated endocytosis. An alternative method of cell penetration used by non-enveloped viruses is for capsid proteins to undergo shape changes after binding to the receptor, creating channels in the host cell membrane. The viral genome is then “injected” into the host cell through these channels in a manner analogous to that used by many bacteriophages. Enveloped viruses also have two ways of entering cells after binding to their receptors: receptor-mediated endocytosis and fusion. Many enveloped viruses enter the cell by receptor-mediated endocytosis in a fashion similar to some non-enveloped viruses. On the other hand, fusion only occurs with enveloped virions. These viruses, which include HIV among others, use special fusion proteins in their envelopes to cause the envelope to fuse with the plasma membrane of the cell, thus releasing the genome and capsid of the virus into the cell cytoplasm. After making their proteins and copying their genomes, animal viruses complete the assembly of new virions and exit the cell. Using the example of HIV, enveloped animal viruses may bud from the cell membrane as they assemble themselves, taking a piece of the cell’s plasma membrane in the process. On the other hand, non-enveloped viral progeny, such as rhinoviruses, accumulate in infected cells until there is a signal for lysis or apoptosis, and all virions are released together. Animal viruses are associated with a variety of human diseases. Some of them follow the classic pattern of acute disease, where symptoms worsen for a short period followed by the elimination of the virus from the body by the immune system with eventual recovery from the infection. Examples of acute viral diseases are the common cold and influenza. Other viruses cause long-term chronic infections, such as the virus causing hepatitis C, whereas others, like herpes simplex virus, cause only intermittent symptoms. Still other viruses, such as human herpes viruses 6 and 7, which in some cases can cause the minor childhood disease roseola, often successfully cause productive infections without causing any symptoms at all in the host; these patients have an asymptomatic infection. In hepatitis C infections, the virus grows and reproduces in liver cells, causing low levels of liver damage. The damage is so low that infected individuals are often unaware that they are infected, with many infections only detected by routine blood work on patients with risk factors such as intravenous drug use. Since many of the symptoms of viral diseases are caused by immune responses, a lack of symptoms is an indication of a weak immune response to the virus. This allows the virus to escape elimination by the immune system and persist in individuals for years, while continuing to produce low levels of progeny virions in what is known as a chronic viral disease. Chronic infection of the liver by this virus leads to a much greater chance of developing liver cancer, sometimes as much as 30 years after the initial infection. As mentioned, herpes simplex virus can remain in a state of latency in nervous tissue for months, even years. As the virus “hides” in the tissue and makes few if any viral proteins, there is nothing for the immune response to act against; immunity to the virus slowly declines. Under certain conditions, including various types of physical and psychological stress, the latent herpes simplex virus may be reactivated and undergo a lytic replication cycle in the skin, causing the lesions associated with the disease. Once virions are produced in the skin and viral proteins are synthesized, the immune response is again stimulated and resolves the skin lesions in a few days by destroying viruses in the skin. As a result of this type of replicative cycle, appearances of cold sores and genital herpes outbreaks only occur intermittently, even though the viruses remain in the nervous tissue for life. Latent infections are common with other herpes viruses as well, including the varicella-zoster virus that causes chickenpox. After having a chickenpox infection in childhood, the varicella-zoster virus can remain latent for many years and reactivate in adults to cause the painful condition known as “shingles”. Chicken pox virus: (a) Varicella-zoster, the virus that causes chickenpox, has an enveloped icosahedral capsid visible in this transmission electron micrograph. Its double-stranded DNA genome incorporates into the host DNA and reactivates after latency in the form of (b) shingles, often exhibiting a rash. Plant viruses can cause damage to stems, leaves, and fruits and can have a major impact on the economy because of food supply disruptions. Plants have cell walls which protect them from viruses entering their cells, so some type of damage must occur in order for them to become infected. When viruses are passed between plants, it is called horizontal transmission; when they are passed from the parent plant to the offspring, it is called vertical transmission. Symptoms of plant virus infection include malformed leaves, black streaks on the stems, discoloration of the leaves and fruits, and ring spots. Plant viruses can cause major disruptions to crop growth, which in turn can have a major impact on the economy. Plant viruses, like other viruses, contain a core of either DNA or RNA. As plant viruses have a cell wall to protect their cells, their viruses do not use receptor-mediated endocytosis to enter host cells as is seen with animal viruses. For many plant viruses to be transferred from plant to plant, damage to some of the plants’ cells must occur to allow the virus to enter a new host. This damage is often caused by weather, insects, animals, fire, or human activities such as farming or landscaping. Additionally, plant offspring may inherit viral diseases from parent plants. Plant viruses can be transmitted by a variety of vectors: through contact with an infected plant’s sap, by living organisms such as insects and nematodes, and through pollen. When plant viruses are transferred between different plants, this is known as horizontal transmission; when they are inherited from a parent, this is called vertical transmission. Symptoms of viral diseases vary according to the virus and its host. One common symptom is hyperplasia: the abnormal proliferation of cells that causes the appearance of plant tumors known as galls. Other viruses induce hypoplasia, or decreased cell growth, in the leaves of plants, causing thin, yellow areas to appear. Still other viruses affect the plant by directly killing plant cells; a process known as cell necrosis. Other symptoms of plant viruses include malformed leaves, black streaks on the stems of the plants, altered growth of stems, leaves, or fruits, and ring spots, which are circular or linear areas of discoloration found in a leaf. 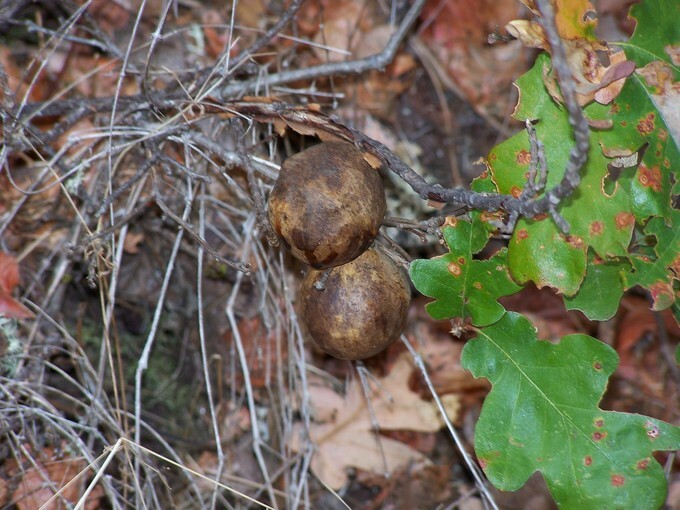 Oak tree galls: Galls are abnormal plant growth or swellings comprised of plant tissue. Galls are usually found on foliage or twigs. These unusual deformities are caused by plant growth-regulating chemicals or stimuli produced by an insect or other arthropod pest species. The chemicals produced by these causal organisms interfere with normal plant cell growth. Plant viruses can seriously disrupt crop growth and development, significantly affecting our food supply. They are responsible for poor crop quality and quantity globally, and can bring about huge economic losses annually. Other viruses may damage plants used in landscaping. Some viruses that infect agricultural food plants include the name of the plant they infect, such as tomato spotted wilt virus, bean common mosaic virus, and cucumber mosaic virus. In plants used for landscaping, two of the most common viruses are peony ring spot and rose mosaic virus. There are far too many plant viruses to discuss each in detail, but symptoms of bean common mosaic virus result in lowered bean production and stunted, unproductive plants. In the ornamental rose, the rose mosaic disease causes wavy yellow lines and colored splotches on the leaves of the plant.